The most interesting IT events of early spring happened to take place between two major occasions of the industry: the spring Intel Developers Forum and the CeBIT 2004 exposition. It all made February a sort of a "warm-up period" during which companies presented their scientific innovations, shared their visions for the future of microelectronics, fine-tuned draft standard requirements and tried to form future standards. Prolonging the ice-hockey metaphore, the second period was marked by a huge show in Hannover where theoretical developments were put into practice and new standards incarnated into hardware were demonstrated for the first time. And the final third period is still ahead. It is likely to fall on April or May when the innovations outlined at IDF Spring 2004 and partially shown at CeBIT 2004 will reach retail networks. Should nothing go wrong, the Taiwanese Computex 2004 exposition scheduled for early June will show completed and even partly available solutions based on new generations of form factors, buses, chipsets, processors, graphic chips, and memory. Well, it is a really interesting time for the IT industry now: test labs are quiet, but curious new-generation products may come flooding in at any time. And since we can now catch our breath waiting for a rush of novelties, let's look back on the recent events, sum up all we know, and try to figure out where the industry is heading to. Luckily, the last two months gave us plenty of food for thought. Despite the fact that a lot of novelties were presented and reached retailers in February (take, for instance, Pentium 4 Prescott chips), it was mostly marked by program declarations for the coming 6, 12, or 24 months. In fact, the Intel Developers Forum is just a place where hundreds of companies publicly sum up the results of their recent developments. I even think that if Intel didn't organise a forum like that, it would still be realised within the community of the industry's leading companies. Let's take, for example, the burning issue of a worldwide standard for fuel power elements of portable electronic devices. We have written dozens of articles on achievements in this field. Last September US Secretary of Energy Spencer Abraham and Japanese Minister of Economics, Trade and Industry Goji Sakamoto signed a declaration on a joint development of standards and technologies, while Japan was still holding consultations on the subject with EU officials. But it was not until the latest IDF that power, lifetime and safety requirements for fuel elements were outlined and introduction deadlines for the respective standards were defined. However, this problem is just one of the instances how industrial interest groups can find a common language. All more or less interesting technological news presented at IDF Spring 2004 are summed up at the end of the article in the form of links to some of our previous materials. We don't want to repeat ourselves and will, therefore, speak about other things. 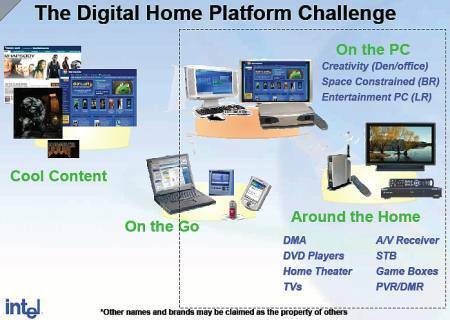 As we know, Intel mainly used the latest Forum to promote its Digital Home concept. We can't say it's one of the company's whims, it rather looks like the problem of a harmonious digital equipment has become acute for developers, manufacturers and customers. So, what is a Digital Home in its current state? And what makes this concept different in the eyes of Intel officials from that home electronic equipment that customers may really need in the nearest future? Availability of all possible data in any place is still the corner-stone of Digital Home; the base program platform is still represented by Windows XP variants focusing on its "home" version Media Center Edition 2004 or its mobile variants. The concept has greatly changed for the six months since the autumn Intel Forum. Thus, its base variants, besides a desktop PC and a playstation, now include Centrino-based laptops and even PDAs. A man's digital environment is still formed basing on the postulate of a close connection between computing power and wireless interfaces. But the current stage of the concept implies a maximal number of information sources: online Internet resources, arrays of data on local storages of home networks, digital TV and radio broadcasting stations that enable to record programs on HDDs, DVD-ROMs, etc. Of course, nobody can predict all possible applications of digital devices even in the coming five years. Who could imagine such a wide expansion of cell phones some 10 years ago? Who could imagine the extent to which they have changed our lives? It's quite probable that the coming years should see a similar mushroom-like spread of some technology that is in embryo now but that will invert our conception of communication and data handling. Let us take, for example, voice input technologies that are in the nursery stage now. Sooner or later, an elegant and simple algorithm of sound digitisation will be invented. Why not if people have created a way to type Chinese words and thousands of their written symbols using a dozen of keys and a predicative T9-like system. Perhaps it's on this path that the problem of voice input will be solved. Perhaps attempts of whole-word identification will be abandoned paving the way for systems based on the key input of Chinese and Japanese hieroglyphs, where input of the first element of a symbol invokes a number of tips for further actions. Who can affirm that such systems won't be simple in use and become as habitual as, say, a bicycle? After Nobel prize awards have calmed down and a couple of years has elapsed, we will once again see two or three new billionaires on our planet. And the thing is that people will no longer be able to do without such new devices, as many can't imagine their lives without a TV, the Internet or a cell phone now. But let's get down to earth and back from the future to Intel Digital Home. Is it possible that due to a new and yet underestimated technology the concept in question will end up in a situation similar to that of lamps-and-punchcards computers described by sci-fi writers who imagined the future basing on the knowledge of their times? In other words, does it make any sense to look into the future and build concepts that may become anachronic in a very short time? Intel seems to have a definitely positive answer for that. Wherever new technologies may bring us, they will surely have to incarnate into something real which will be made using advanced hardware and software. Bill Gates has recently expressed an alternative vision of the future. According to him, hardware part of digital technics will soon become extremely cheap and so, software will move to the foreground. Well, I think these Yin and Yang of the IT industry will still develop side by side like the Microsoft Longhorn program platform and its hardware side  Intel Vanderpool. Always knowing where the wind blows, coming up with vital solutions and forming the fasion instead of just following it  this is, probably, the best one can do to keep up and not to perish in these wild changing times. And Intel surely won't perish whatever the circumstances, because what it is doing now is it plays a complex role in market formation supplying the most part of advanced key components for most devices, from cell phones to servers. Concerning concepts, each can find their presentations very useful for himself: one can criticise them, or add his own ideas to them, or use them as a guidance. Previous expositions show that there are enough realisations of both Intel's ideas and quite good and original developments made by other companies, although within the same elemental base. For Intel, concepts are more than just beautiful pictures. They mean thousands of working hours the engineers have spent dealing with ergonomic, aesthetic aspects and also with inside issues, such as compatibility and sensibility of form factors, optimisations of thermal and energetic parameters, safe work with data, and many other things. 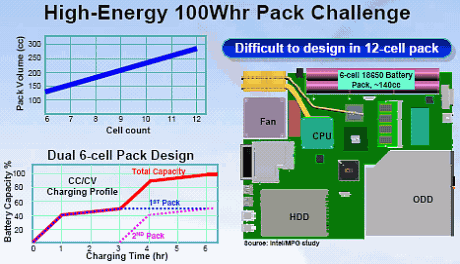 IFD Spring 2004 triggered changes in the inside of Digital Home components, that were in line with Intel's plans. And now, besides a Pentium 4 CPU and Hyper-Threading support the concept is also supplied with i9xx chipsets, LAN adapters GbE and 802.11, SATA storages and DVD-ROMs, a two-channel DDR2 memory, the LCOS technology (Liquid Crystal on Silicon). Moreover, the Forum defined an evolution way for the architectures of Pentium 4, Pentium M, Itanium 2 and Xeon CPUs, and the Sonoma mobile platform; specific platform variants were presented, that meet the defined CPU heating norms and the BTX specs. IDF Spring 2004, Craig Barrett states: "Intel's 64-32 extensions will work on the same platform as AMD64 instructions do"! 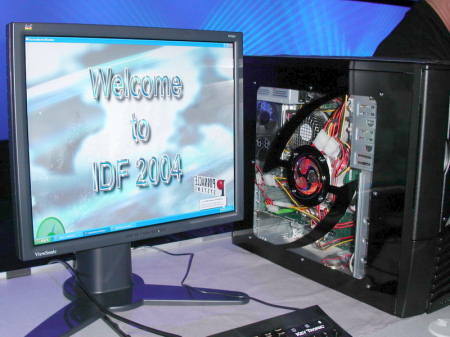 Photos from IDF Spring 2004: ATI RV380, AverMedia Dual Tuner, etc.